A modern version of the Hansel and Gretel fairy tale, with little relevance to the original. After getting a taste for blood as children, Hansel and Gretel have become the ultimate vigilantes, hell bent on retribution. Now, unbeknownst to them, Hansel and Gretel have become the hunted, and must face an evil far greater than witches... their past. The critics were not impressed, although initial box office receipts were good. This film is releasing in both 2D and 3D, this is the 2D version. 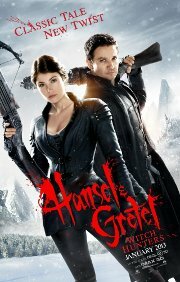 Comments Hansel and Gretel, the children's fairytale is re-interpreted and adapted for mature viewers and action lovers. The brother and sister team up to hunt evil witches.